• $1 off wells, tap beers & select wines. Select discount happy hour food menu. 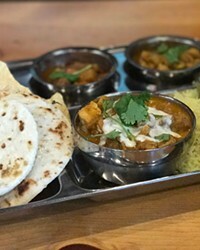 Fans of The Curry Shack food cart will be happy to note that its owners now have their own brick and mortar restaurant, right in the heart of downtown Bend. 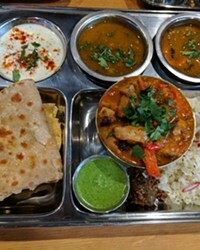 A modern, fast-service Indian spot featuring samosas, pakoras, rice and curry bowls and Thali meals. Happy Hour daily 3pm-6pm. Visit our Facebook Page! A quick service Indian spot with a full bar.